Inventory We are a resale marketplace, not a box office or venue. Ticket prices may exceed face value. This site is not owned by Ravinia Pavilion . The Ravinia Pavilion hosts the oldest outdoor music festival in the United States during the summer months. The Ravinia Pavilion box office is located PO Box 896 in Highland Park, Illinois. The Pavilion provides seating of up to 3,200 fans. The concert series has been in use since 1904 and is the summer home to the Chicago Symphony Orchestra. Some memorable Ravinia Pavilion tickets have included performers like the Beach Boys, Bob Dylan, Lynyrd Skynyrd, Maroon 5, Sting, Janis Joplin, Tony Bennett, Bonnie Raitt, Carrie Underwood, and many more. The Ravinia Festival also has two other smaller venues onsite in the Martin Theatre and Bennett Gordon Hall. 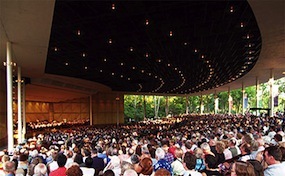 Ravinia.PavilionHighlandPark.com is not affiliated with any official website, primary seller, and or venue. We are a privately owned and operated company that concentrates in all online sales in the secondary ticket market. Prices on our sites may be above or below face value and can change quickly with demand. To order tickets to all Ravinia Festival Highland Park events simply navigate the steps online of pick up the phone at anytime and call our operators who are standing by.